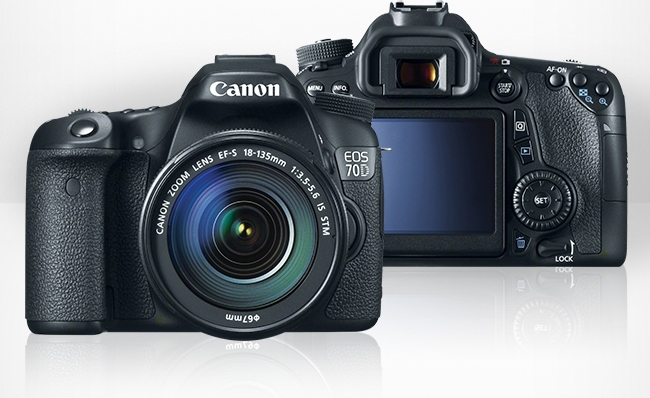 Canon has just announced their newest mid-range DSLR: the EOS 70D. This Wi-Fi-connected camera falls in the EOS lineup between the 60D and the 7D as a high-performance, APS-C-sized DSLR that features the newly designed Dual Pixel CMOS AF technology, a refined 20.2MP APS-C image sensor, and a 3.0” vari-angle touchscreen LCD monitor along with a host of photographic and video-centric assets that combine to form a truly powerful image-making device that can handle video and still photo tasks with ease. Where this camera separates itself from previous models is through its combination of features that strive to generate higher-quality imagery with a rich feature set that facilitates wireless sharing, intuitive navigation and control over camera settings as well as an overall sense of efficiency throughout the entire system. The most refined technology that differentiates the 70D from all past EOS cameras is its inclusion of the newly designed Dual Pixel CMOS AF system, which serves as the successor to the Hybrid CMOS AF II focusing system. When viewing videos of how this focusing system works in real time, it is clear that changing focus between subjects is handled in a smooth and natural manner with no jumping or hunting during focus shifts. It works in a highly intuitive manner with focus quickly changing between the intend ed subjects and maintains sharpness if the subject is moving through the scene. Allowing for more personalized control, too, Dual Pixel CMOS AF is equally adept at accommodating personal selection of focus points via the touchscreen interface for selective focus and shallow-depth-of-field effects. This intelligent method of focusing begins at the sensor level and integrates two photodiodes into each pixel, in order to reap the benefits of a broad phase-detection sensor. The 40.3-million photodiodes cover nearly the entire sensor surface, for faster and more accurate focusing that is equally as smooth and adept at locking onto and tracking moving subjects. Having two photodiodes in each pixel helps to provide an inherently more comparative method of focusing from the beginning. Information is split and projected onto each of the photodiodes; the difference in signal from the separate diodes is then calculated in order to quickly determine the focus placement and drive the lens directly to this point. Since the difference in signals is determined prior to moving the lens’s focus position, proper focus can be attained in a single motion with no hunting or shifting. The benefits of this system extend into three distinct areas: speed, ability to fully utilize the LCD monitor in live view, and compatibility with more than 100 past and present EF and EF-S lenses, including the STM series of lenses for enhanced video-recording performance. Compared to previous iterations of live-view focusing mechanisms, Dual Pixel CMOS AF works to eliminate a camera’s need to hunt for critical focus, and instead can quickly focus on the intended subject. Focus can be acquired in a straightforward and direct manner with no additional time required to measure before and behind the subject; the focus simply locks onto the subject in one single motion. This afforded speed is due, in part, to both the number of photoreceptors as well as the expansive area they cover. While the speed offers the greatest benefit to still-image creation, the focusing is also handled in a smooth manner, with natural transitions between different subjects and when main taining focus on a moving subject. This fluidity is similar to the way a camcorder focuses and, as such, truly benefits video recording with the 70D. Expanding this system’s role further, Dual Pixel CMOS AF works in close collaboration with the Touch AF function on the 3.0” 1,040k-dot vari-angle Clear View II touchscreen LCD monitor. This screen’s touch capabilities allow you to simply touch anywhere in the frame to select the point of focus. This is especially useful when recording video and working with rack-focus techniques; the focus shifts from one element to the other in a seamless and smooth manner while focusing accuracy is maintained. The quickened pace and intuitive focusing interface, using the screen, truly allows full use of the LCD monitor as a powerful viewing and composing tool for both still and video applications. While the speed of the live-view focusing isn’t quite as expedient as when working with the optical viewfinder, it is substantially improved compared to previous models’ live-view performance. Extending the monitor’s capabilities is a design that permits easier viewing from high and low angles as well as from the side of the camera. Autofocus can be ensured and reliable no matter what the viewing angle, giving way to a broad range of shooting positions and abilities that were previously more difficult to achieve. Finally, this focusing system is compatible with a wide range of EF and EF-S lenses: 103 in total at the time of this announcement. This includes both past and current lenses that support this newly developed focusing technology. Furthermore, Dual Pixel CMOS AF supports the recently introduced Movie Servo AF mode, which pairs especially well with STM lenses that incorporate a stepping motor for near-silent focusing. This focusing mode is used when recording videos to provide full-time continuous autofocusing with subject tracking capabilities. When combined with the Dual Pixel CMOS AF system, this mode functions in an even more seamless and responsive way with intelligent autofocusing that can be refined through the Touch AF for selective focusing when recording. In regard to the imaging performance of the 70D, it utilizes a 20.2 megapixel APS-C CMOS sensor and DIGIC 5+ image processor to produce high-resolution imagery that exhibits a wealth of detail and natural rendering of color and tone. The processing power from the DIGIC 5+ works to enable 14-bit A/D conversion, which helps to produce images with smooth gradations and overall fluency for greater apparent clarity in both photographs and movies. The 20.2MP sensor is the highest-resolution APS-C-sized sensor Canon has ever created, and as such, enables larger file sizes for more post-production versatility and larger print output sizes. Even though the pixel count has reached a new high, Canon has also ensured that th e low-light performance of the 70D is maintained, due to the inclusion of the same image processor that is used in their full-frame DSLRs: the EOS 6D, 5D Mark III, and 1D X. Native sensitivity is rated at a range of ISO 100-12800, which is further expandable to ISO 25600, and the 14-bit signal processing helps to minimize visible noise when working with these higher sensitivity levels. Aside from the image quality attributes provided by the sensor and processor, overall speed and performance is also enhanced throughout the camera system due to this combination. A full-resolution continuous shooting rate of 7 fps is possible, with burst rates up to approximately 60 consecutive JPEGs or 14 consecutive RAW files; full HD 1080p video recording is supported in multiple frame rates with manual exposure and audio level control. Another first for APS-C DSLRs from Canon is the integration of in-camera wireless connectivity for instant sharing and remote-control possibilities. Just as with the full-frame EOS 6D, the free Canon EOS Remote app is available for iOS and Android mobile devices and can control exposure settings (aperture, shutter speed, and ISO), focus, and release the shutter wirelessly, from a distance. Live-view monitoring is also supported on devices during use as a viable means for monitoring subjects within the composed image frame. In addition to camera controls, the wireless feature enables the sharing and transferring of image files directly from the camera to mobile devices, other wireless-enabled Canon cameras, and to network-connected computers. Once files have been transferred to a mobile device, instant sharing via email, social networking sites, and cloud storage sites is possible. Files can be sent to the CANO N iMAGE GATEWAY for expedited posting to social media sites, and remote viewing of stills and movies is also possible on DNLA (Digital Living Network Alliance) compatible devices, such as HDTVs and other wireless-connected devices. Wireless printing of photos is also possible straight from the camera when connected to a Pict-Bridge-compatible printer. The EOS 70D is also compatible with the optional GP-E2 GPS Receiver, which enables geo-tagging and the embedding of locational data into images’ metadata for plotting to interactive maps. Elevation, direction, and Universal Coordinated Time (UTC) are also recorded along with the longitude and latitude of each recorded image. Serving an array of the technologies housed within the 70D, the 3.0” 1,040k-dot vari-angle Clear View II touchscreen LCD monitor is an efficient and intuitive means for live-view monitoring, image playback, and menu navigation. Its touch capabilities greatly enhance working in live view while shooting by way of Touch AF and a host of other touch-sensitive camera controls. Additionally, it gives way to a more natural method of navigating through menus when compared to working with conventional wheels or dials. The vari-angle design of the monitor is ideally suited for working from high and low angles, as well as viewing and composing from the side of the camera. When coupled with touch control and the Dual Pixel CMOS AF system, live-view monitoring can now be used to the same extent and set of expectations as an optical viewfinder, giving way to fast and reliable focusing performance with versatile control and viewing abilities that are not otherwise possible. The screen itself features an anti-reflective smudge-resistant coating that makes viewing in bright light easier. For viewing in a more traditional manner, an optical pentaprism viewfinder is also integrat ed into the 70D and provides 98% frame coverage for clear eye-level finding. A superimposed LCD monitor is added to the viewfinder’s construction to allow for monitoring of crucial camera settings while viewing and, additionally, focus points, grid lines, and an electronic level can be activated to further aid composition. When using the viewfinder, a 19-point all cross-type AF system is used to acquire focus deftly, even in difficult lighting conditions. The center point of this system is a high-precision, dual cross-type sensor that is compatible with f/2.8 and faster lenses. The cross-type design of these points ensures their accuracy with a greater range of subjects, and their configurable nature also allows you to tailor their results and use them for specific shooting applications. The multi-layer 63-zone iFCL (intelligent Focus Color Luminance) exposure metering system is employed for both still image and movie recording in order to accurately depict any scene, regardless of lighting conditions. This metering system utilizes information garnered from focus, color, and luminance in order to set exposure precisely. The 63 zones cover a broad area of the image frame and the dual layer design (one red/green channel and one blue/green channel) works to offset the inherent red-light-sensitivity bias of image sensors in order to produce consistent and repeatable results. Evaluative, center-weighted, and spot-metering methods can be used to determine specific exposure setting results and +/- 5 EV still and +/- 3 EV movie exposure compensation is available when working in program AE, aperture-priority AE, and shutter speed-priority AE shooting modes. Besides the creation of vivid still images, the 70D also supports the creation of full HD 1080p movies at 30, 25, and 24 fps frame rates. When recording videos, manual exposure control is available for refining the look and feel of movies through adjustment of the shutter speed, ISO sensitivity, and aperture setting. In addition to exposure control, audio levels can be adjusted across 64 levels and sound can be recorded using the built-in stereo microphone or with an optional external microphone, connected via the 3.5mm microphone terminal. Sound recording is the beneficiary of an automatic attenuator function that helps to alleviate audio clipping, for cleaner overall sound. Movies are saved using the high-quality H.264/MPEG-4 AVC codec, and video files greater than 4GB are automatically split for extended recording sessions (up to 29 minutes and 59 seconds). Additionally, both IPB and All i-frame compressions are available for use, depending on editing preferences and the final output destination. Moving subjects are consistently and smoothly tracked for Full HD video that is in sharp focus. Just as with still shooting, video recording benefits from the Dual Pixel CMOS AF system and its ability to provide smooth focusing that is both controllable and accurate. The Movie Servo AF mode provides continuous focusing during filming with subject tracking and also affords full compatibility with Canon’s STM lenses for extremely quiet focusing. The Touch AF function enables precise control over the exact placement of focus within the scene and is usable during recording as a viable means to control focus without having to touch the lens or move the camera during operation. By using the Touch AF control, rack focusing is possible to help swiftly move attention across the scene and to highlight specific elements in the frame when working with wider apertures, for shallow-depth-of-field shots. Also serving to enhance creativity with movie recordings is the Video Snapshot mode, which allows recording of movies in clips of 2-, 4-, or 8-second segments and automatically stitches them together sequentially. This compilation of short video clips can then be set to music in-camera and output as one finalized edit—eliminating the need to manually sequence and edit with a computer. For creatively modifying and enhancing the look of imagery in-camera, a wide array of options can be selected in-camera, ranging from HDR and Multiple Exposure modes to creative filters and scene modes. The High Dynamic Range (HDR) mode will automatically record a series of bracketed exposures in-camera and composite them together, in order to produce a single exposure that has extended highlight and shadow details along with an extended tonal mid-range. This is ideal for high contrast and backlit situations where the difference in exposure values in the scene is greater than a single exposure can record. Similar in approach, yet able to yield more creative possibilities, is the Multiple Exposure mode. When working in this mode, several exposures can be created manually and overlaid into a single file. Two distinct control settings are available for this: Additive and Average. The Additive setting closely resembles the process of creating a multiple exposure using film, in which each consecutive exposure is layered and the final exposure level is built-up across each frame. The Average setting will, rather, blend the recorded exposures into a final exposure that maintains a neutral density in order to avoid extreme under- or over-exposure. Scene Intelligent Auto mode is an analytical auto-exposure mode that combines many of Canon’s exposure technologies together in order to produce imagery with refined exposure settings. Picture Style Auto, Automatic Lighting Optimizer, Automatic White Balance, Autofocus, and Auto Exposure all work in concert to carefully analyze the scene in order to calculate the most effective exposure settings to clearly render the subject. Also working to produce proper exposures, especially in difficult lighting conditions, are HDR Backlight Control and Handheld Night Scene modes. Both modes work in a similar fashion by recording multiple exposures of the same image and then compiling them in order to produce an image that exhibits reduced camera shake or greater shadow and highlight detail. For creative modification and enhancement of imagery, seven different Creative Filters are available and can be applied during shooting with results visible during live-view shooting. In addition to the 70D being available as a body only, it is also available in a kit with either the EF-S 18-55mm f/3.5-5.6 IS STM lens or the EF-S 18-135mm f/3.5-5.6 IS STM lens. The 18-55mm lens provides a 35mm equivalent focal length of 28.8-88mm and the 18-135mm provides a 35mm equivalent focal length of 28.8-216mm. Both lenses provide a range of coverage, from wide-angle to portrait and telephoto lengths, respectively. Both of these lenses are designated as STM lenses, which incorporate a stepping focus motor that helps to produce near-silent results when recording movies. They both also incorporate an optical image stabilization system that benefits image sharpness by the equivalent of four shutter-speed steps through the reduction of the appearance of camera shake. A new battery grip for the 70D is also available to provide extended shooting capabilities and a more ergonomic way to handle the camera. The BG-E14 grip accepts up to two LP-E6 rechargeable lithium-ion battery packs or six AA batteries and is also compatible with the ACK-E6 AC Adapter Kit for constant AC power. The grip design incorporates several operating controls, including a shutter release, main dial, multi-controller, AF point selection button, AE/FE lock button, AF start button, and a multi-function button to increase functionality and operability while shooting in vertical orientation.